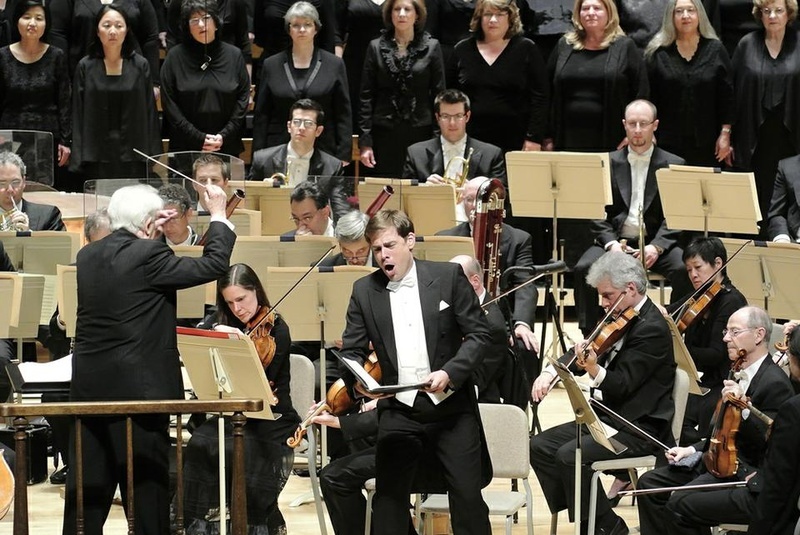 Conductor Christoph von Dohnányi leads bass-baritone soloist Hanno Müller-Brachmann, the Boston Symphony Orchestra, and the Tanglewood Festival Chorus in Brahms's "Ein deutsches Requiem." One of the numerous virtues of the Boston Symphony Orchestra is that patrons can expect a great performance every single time they attend with little risk of disappointment. Very few orchestras in the world can be trusted with a masterpiece like Johannes Brahms’s “Ein deutsches Requiem,” which demands a large but technically precise choir and a disciplined orchestra to support it. But Thursday night, the BSO joined forces with the Tanglewood Festival Chorus to perform the piece, and under the skillful leadership of guest conductor Christoph von Dohnányi, more than 200 musicians on stage that night made their way triumphantly through the redemptive beatitudes and confrontations with death in the great German requiem. They will give their final performance of the piece tonight in Boston’s Symphony Hall. The requiem has a richly emotional history reflected in the piece’s depths and details. When Brahms started writing the piece, his mother had passed away, and his mentor Robert Schumann had just attempted suicide. Brahms was still afflicted by his feelings of inadequacy next to Beethoven, whom he revered. Before Brahms, Mozart and Berlioz had also written requiems for the dead—both of which had become career-defining works. The forms are very structured, and though somber in tone due to their liturgical roots, the pieces always end on a celebratory note that signifies looking forward to the glory of the afterlife. Brahms’s work calls for two soloists, a soprano and a baritone. Anna Prohaska made her BSO debut in the soprano role, and in a majestic entrance, she glided on stage as if riding a cloud. Expectations ran impossibly high, yet she ably performed her solo in the fifth movement. Her voice had considerable strength, and her delicate last notes in pianissimo—delivering the lyrics “Ich will euch wieder sehen,” which translate to “I will see you again”—proved that she was an elegant complement to the vigor of the BSO. German bass-baritone Hanno Müller-Brachmann’s polished performance was characterized by fluid and emotional expression of the text. His solo in the third movement was technically impeccable, though his performance would have been stronger if he had dug a little deeper into the lower notes. Prohaska and Müller-Brachmann were both impressive, but no amount of charisma could have overshadowed the achievement of the Tanglewood Festival Chorus that night. The chorus was a vision of unity and control, and despite its size, it maintained a dynamic balance across its register and delicately handled the requiem’s soft passages. Director John Oliver has amassed an incredibly talented group, particularly the men of the choir—the entrance of the lower register in the second movement was executed with power and emotion. The fugal choral passage in the sixth was a testament to the choir’s technical precision. The intricate backdrop to all this was the accomplished performance of the BSO. Though in the past the ensemble has struggled with its bursting energy in accommodating soloists, the BSO performed the German requiem with incredible discipline. The final instrumental chord of the second movement was outstanding—one might even say perfect—in its distribution of dynamics over the range of the orchestra. Through the 75-minute concert, the austere von Dohnányi held refined control over all the musicians, who responded instinctually to his gestures as he guided them between deliberate gravitas and brooding emotion. At the end of the sixth movement, the full choir sang, backed by aggressive strings, “Tod, wo ist dein Stachel? Hölle, wo ist dein Sieg?” (“O death, where is thy sting? O grave, where is thy victory?”) If there is such a thing as an aesthetic absolute, this moment brought the Boston Symphony Orchestra ever closer to it. At the very least, Brahms’s feelings of grief, fragility, and strength live on in Symphony Hall.